Do you find grocery shopping with kids stressful? I used to hate it, the kids were bored and got into trouble because they were bored. 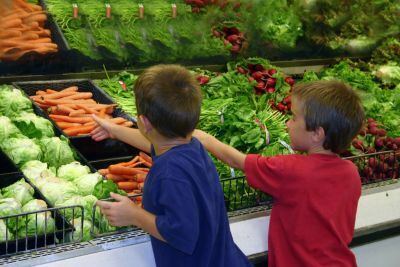 Most kids dislike grocery shopping. It can be boring noisy and busy. If your child is autistic as our younger daughter, or with another disability, they may struggle more. It is something about the environment of a big supermarket that triggers kids into unreasonable behaviour. You will find that giving the kids something to do while you are shopping will help a lot. We found stickers for good behaviour helps. Have a plan in case you get separated, this has happened a couple of times with us. It is scary for us parents but even more so for young kids. Give the kids clear rules such as "stay by me" and "no sweets". Be clear what will happen if your child does not behave. Always do what you have said because your kids need to know your yes is yes and your no is no. If you have said "you can have sweets if well behaved", don't give them if your child has misbehaved. if your child has a temper tantrum or meltdown then take them to the restroom or outside to calm down. Don't worry what other people think. remain calm and in control. If your child calms down try again. If not give up the shopping trip. Give more responsibility as kids are able. An idea our kids have loved to do is they plan a meal and make it for us. The kids come up with a menu by looking through cookery books. They make a list of ingredients and check whether they need to buy these. Take the list to the grocery store with you. The kids are in charge of making sure they get the ingredients on their list. Have them check out your store cupboards and the fridge. It is easiest to start this by telling them they need to check for yoghurts for instance. Ask them to check how many you have. With the kids work out how many yoghurts you will need for a week. Start simple "if you eat a yoghurt a day for a week how many yoghurts do we need. If you need yoghurts get kids to write it on a list. Do the same with other grocery shopping you need. If your kids are young it will take a while. Be patient and let them do it. It is good for writing skills and for math skills. If your child cannot read or write or finds it difficult use pictures. We used pecs(picture exchange communication system) for a time. Have your child count items into bags for example "put five oranges in the bag"
Find six of the best apples. Can you find a square shape. Show me the green apples. what is inside this tin. What could we use this for ie. flour could be used for cakes, pancakes, biscuits etc. Which bread do we have? How much is the bread? If the bread is on sale at .... how much money will we save? Oranges contain vitamin C what do our bodies need it for? Work out how much the bread, carrots and potatoes will cost. If this item costs ...how much change will I have if I pay with...? Can you find a pyramid shape? Talk about the ingredients that processed foods contain. Teach kids about time management, set your watch for 30mins or 45mins and they can watch the time go. Let them be responsible for a list of shopping that they must get. Show them how to pay at the checkout. Let them carry their bag of groceries to the car and then be responsible for putting it away at home. Shop with kids when its not busy whenever you can. Accept shopping will take longer with kids. Expect good behaviour and reward it. Don't go shopping when kids are hungry or tired. Try giving kids raisins to eat on the way round. Teach shopping skills as you go.